This is one of my Daddy’s favorite things. I had never made it before tonight, but I’m glad I tried it out, because it was a hit. If you like the traditional version, I think you’ll love this low calorie alternative. Not too difficult, but a bit time consuming since you have to let the eggplant sit to draw all the moisture out. Very delicious. Wash and dry eggplant, and slice it into 1/2 inch slices (they should be round). You should have about 20 slices. In a shallow dish, mix bread crumbs, garlic powder, and parmesan cheese. In a separate shallow dish, mix egg whites and water. Whisk until they are well combined. Once Eggplant is done resting on the paper towels, wash each slice off and pat dry. 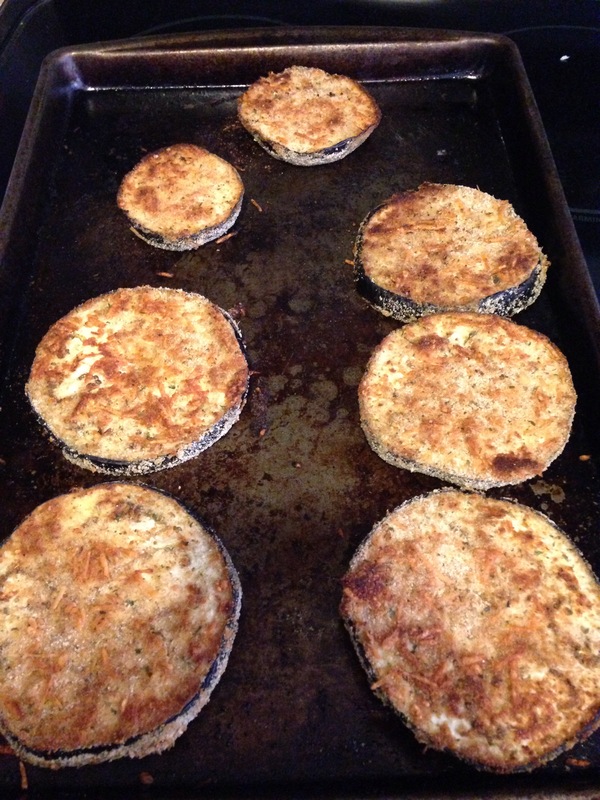 Dip each slice of eggplant into egg wash, and then press down into breadcrumb mixture, covering both sides with breading. 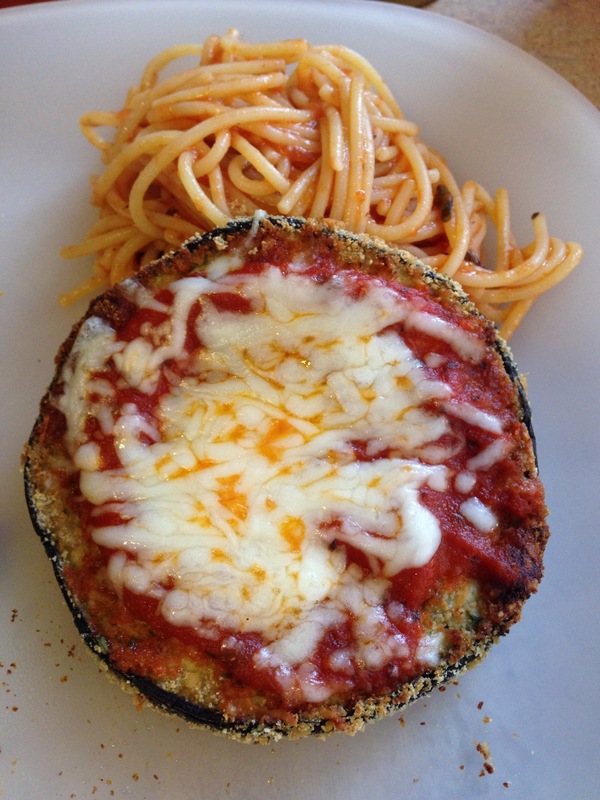 Place eggplant slices in a single layer on 2 baking sheets which have been sprayed with non stick spray. Bake on 450 for 20 minutes, flipping each slice halfway through cooking. 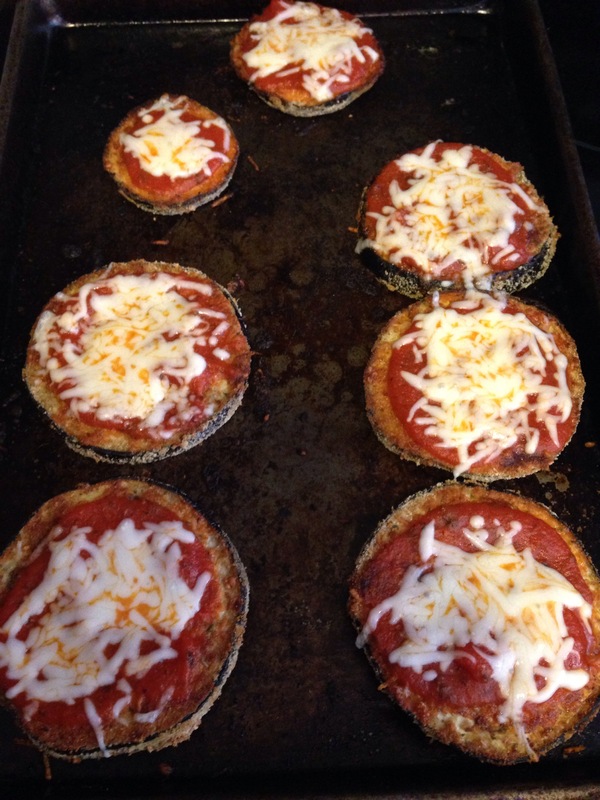 Top each slice with about 1 tablespoon of marinara sauce, and sprinkle mozzarella cheese over the slices evenly. Return to oven and bake an additional 3 minutes, or until cheese is melted.